In the study of genetics, a population bottleneck is an event in which the gene pool of an existing population of organisms experiences a drastic reduction of diversity, and a change in the distribution of alleles. 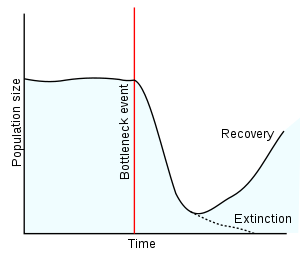 Various mechanisms can lead to a population bottleneck. The founder effect is a special case of a bottleneck, where a small subset of a population founds a new population, having migrated to a new area, e.g. an island on the coast. The key features of this particular variety of bottleneck are the new location and that the original population survives. The most famous example of the founder effect in humans is in the Amish people of the United States. A small population of Amish left Europe in the early 18th century CE for Pennsylvania. The Amish are not inclined to breed outside their own church, creating a closed population. This has led to the preservation of a number of genetic disorders in the Amish community. More often, however, what is referred to as a bottleneck is when the majority of a population dies off, leaving only a small number of survivors to go on. A more contemporary, smaller-scale example occurred on the island of Pingleap, Micronesia. The island is noted for its unusually high incidence of achromatopsia, a type of total color-blindness, among its native population (i.e. ~5% incidence among adults, vs. 0.003% among American adults). This can be traced back to a tropical storm in 1775, in which all but 20 Pingleapese natives were killed, and the surviving ruler, Mwanenised, was suggested to be a carrier. The cheetah, individuals of which are so genetically related to each other that skin grafts can be transplanted without risk of rejection. It may have suffered a bottleneck in the last ice age. Similarly, the Giant Panda likely went through a bottleneck around 40,000 years ago. Any endangered species can be considered to be going through a population bottleneck at this time. One well-known example of a human-made bottleneck is the common banana, the genetic diversity of which is now nearly nonexistent by means of selective, seedless grafts. Genetically speaking, most of the bananas one might see at one's local supermarket come from what is, functionally, the exact same plant. This has resulted in significant concerns about potential future blights, which, with no immunity, could scythe through and eliminate the delicious fruit. This is particularly worrying, as the exact same thing has happened already when a fungal disease wiped out almost all exemplars of "Gros Michel", the preferred type of Banana up to the 1950s. It was replaced by Cavendish, solving the problem for now, but there are again diseases to which Cavendish is susceptible, making it likely that there will be a repeat in the not too distant future. When a new population is formed it is highly unlikely to have the same level of genetic diversity as the parent population. Especially in non-founder effect situations, i.e. when the parent population is killed off, this loss of diversity is permanent. What this means is that if a species comes extremely close to extinction but rebounds, it is not necessarily out of the woods yet. Additionally, an extended bottleneck can lead to inbreeding, causing further problems. The founder effect can be important in speciation, as the separation of the new population causes it to evolve separately from the parent, and the loss of diversity may paradoxically give the new species a head start in this. ↑ See the Wikipedia article on Toba catastrophe theory. for more information. This page was last modified on 7 January 2019, at 05:28.